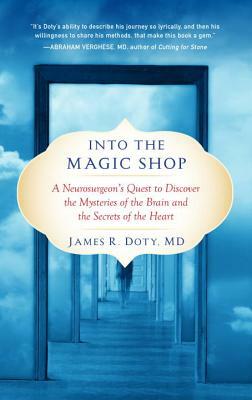 Into the Magic Shop: A Neurosurgeon's Quest to Discover the Mysteries of the Brain and the Secrets of the Heart (Paperback) | Eagle Harbor Book Co.
What an enlightening memoir! In 1968 in Lancaster, California, a young boy with an alcoholic father and an often bed-ridden mother happens into a magic shop. He finds not the owner but the owner's mother who, as they speak, intuitively understands his outlook on life. She instructs him in the basics of meditation, of calming his mind, and finally of visualizing his goals in life. It's a powerful talent and one that in the future allows him to succeed as a college student and eventually as a neurosurgeon. Not until he also taps into the benevolence that he learned from the owner's mother, however, does he achieve peace of mind. It's a fascinating study of the mind's power and well worth reading.